Maybe it is debatable whether this is a real war movie in the strict sense of the term (but then, what is that anyway?) but I believe whenever there is armed conflict executed by an army or large group of people, even though not on a global scale we have to speak of war. On January 30 1972 the British army opened fire on a peaceful Civil Rights March in the city of Londonderry in Northern Ireland. On this day 27 people were shot and 13 of them lost their lives. A further victim died a few months later. This day was from then on called Bloody Sunday. It was a huge blow to the Civil Rights Movement and ended in countless young men entering the IRA. What followed is a history of bloodshed and terrorism that would not end until the 90´s. On June 15 2010, after an investigation of 12 years had been conducted and found that the British army had opened fire without a reason, the British Prime Minister Cameron apologized for this crime. The so-called Saville Report has cost 230 million Euro. It proved without any doubt that the soldiers were at no time shot at. They opened fire on people who tried to flee, take refuge or wanted to help others. Two thirds of the victims were only 17 years old. When this movie was shot, although largely known, there was no actual evidence as to the truth of these facts. We know them now and thus the movie unfurls vividly before the spectators eyes the whole extent of this tragedy. 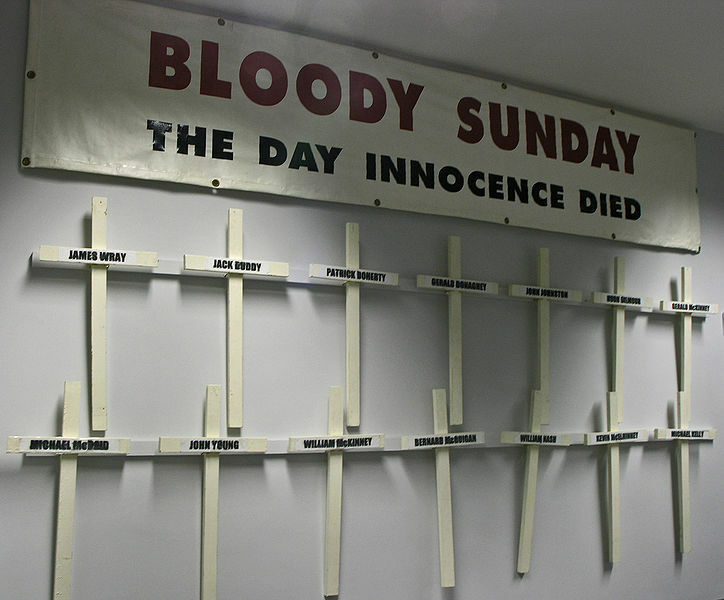 Bloody Sunday is not easy to watch and the first two thirds were so annoying that I was tempted to stop it. This is solely due to the technique. It is filmed documentary style with a shaky hand-held camera. We see three complementary points of view. The Civil Rights Movement´s, the Police Headquarter´s and The Army Company´s stationed in the street. The camera fades to black for every scene. During the bits at the Police Headquarters there is a constant ringing of telephones that drove me almost mad. Also at the Civil Rights Movement´s Head Quarters, just before they assemble on the street, phones keep on ringing. The movie basically shows the whole day from early morning until its bloody end. We see the people prepare for the march, the police debating at what point they should stop the march and the soldiers on the street taking position. It is worthwhile to sit through these annoyances though. The last third, when the march turns into a tragedy, is extremely powerful and the documentary style filming adds to the realism to an almost unbearable extent. What we watch is such a tragedy that we can barely believe it. To shoot at people who shout for help or try to help others looks like an execution. Saying all this I think the movie shows nevertheless, no matter how misguided the army was or how brutal their reaction, that they were also under a lot of stress. Some of their own had been killed a few days before, they were constantly attacked, bottles thrown at them. As so very often it is shown that those on the street (very much like those on the battle field) depend on their command in the Head Quarters who failed them completely. They misjudged everything, thought that sheer force would end it all and boy were they wrong. And, as always, they never pay a price in lives. At the end of the movie there is a scene when every single victim is named. Every individual anonymous victim seems to become a face. When watching the end I was surprised at how much this movie got to me. 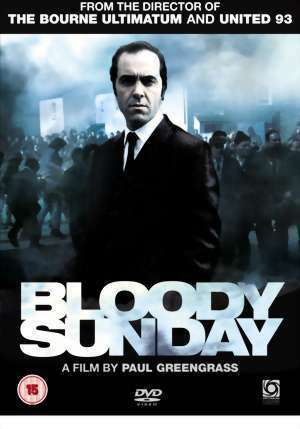 This entry was posted in History, Movie, Northern Ireland Conflict, Reviews, War Movie and tagged Bloody Sunday, Bogside Massacre, History, IRA, Irish Civil Rights Movement, Movies, Nothern Ireland Conflict, Reviews, The Troubles, War Movies.